India and Germany are deepening their collaboration in the area of skill development. An implementation agreement was signed between the Ministry of Skill Development and Entrepreneurship (MSDE) and (German International Cooperation (GIZ), to initiate a new project focused on adapting elements of the German dual system in select industrial clusters in India. This new project will run for three years starting August 2016 with a budget of EUR 3,000,000 (22.6 Crores INR) – made available by the German Government and aims to foster conditions which will help create and improve cooperative workplace-based vocational training in India's industrial clusters. The project will be implemented in three selected clusters, which include the Automobile cluster in Maharashtra and Electronics cluster in Bangalore. German technical assistance will be used to enhance industry institute partnerships between Indian and German organizations, build capacity of local training institutions and foster industry linkages which will help adapt elements of the German dual system, into the Indian context. This new project will also play an important role in supporting MSDE's existing programmes to scale up apprenticeship training. The first meeting of the Governing Council of the National Skill Development Mission (NSDM) was held under the Chairmanship of Hon’ble Prime Minister of India, Shri Narendra Modi on 2 June 2016. In his remarks at the meeting, the Prime Minister stressed on the need for proper skill mapping and identification of the future requirements for skills, so that school-children and parents are well aware of the emerging trends in the job market. Further, he said a similar exercise should also be done to map the skilled manpower requirements at the global level, so that India can meet the global requirement of skilled workforce. Government here today launched SKILL INDIA on the occasion of the first-ever World Youth Skills Day. 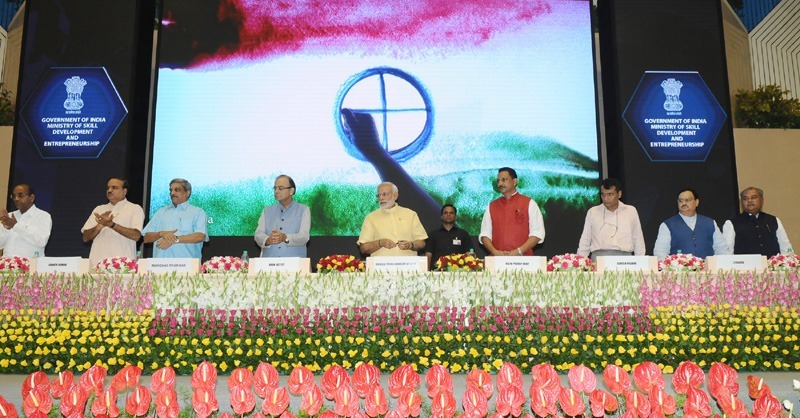 Prime Minister Shri Narendra Modi was the Chief Guest for the event, which was held in the Plenary Hall of Vigyan Bhavan. The Minister of State (Independent Charge) for Skill Development and Entrepreneurship Shri Rajiv Pratap Rudy was the Guest of Honour on this occasion. Union Ministers Shri Arun Jaitley, Shri Manohar Parrikar, Shri Suresh Prabhu, Shri Anant Geete, Shri Jagat Prakash Nadda, Shri Ananth Kumar, Shri Narendra Singh Tomar, Shri Thaawar Chand Gehlot, Shri Piyush Goyal and Shri Santosh Kumar Gangwar were present on the dais. Several Chief Ministers, State Ministers, Secretaries to the Government of India and other representatives from central and state governments were also present at the event. Foreign dignitaries, including Ambassadors and High Commissioners, senior industry leaders, representatives of multilateral organizations and from industry associations also attended the two-hour long main function. ITI faculty, skill trainers and trainees from a range of training programs also participated. The Union Cabinet chaired by the Prime Minister, Shri Narendra Modi, yesterday gave its approval for the institutional framework for the National Skill Development Mission in keeping with the commitment made during the Budget Speech for 2015-16. The National Skill Development Mission will provide a strong institutional framework at the Centre and States for implementation of skilling activities in the country. The Mission will have a three-tiered, high powered decision making structure. At its apex, the Mission’s Governing Council, chaired by the Prime Minister, will provide overall guidance and policy direction. The Steering Committee, chaired by Minister in Charge of Skill Development, will review the Mission’s activities in line with the direction set by the Governing Council. The Mission Directorate, with Secretary, Skill Development as Mission Director, will ensure implementation, coordination and convergence of skilling activities across Central Ministries/Departments and State Governments. The Mission will also run select sub-missions in high priority areas. Further, the National Skill Development Agency (NSDA), the National Skill Development Corporation (NSDC) and the Directorate of Training will function under the overall guidance of the Mission. The Ministry of Skill Development and Entrepreneurship (MSDE) provides a natural home for the Mission, organically linking all three decision making levels and facilitating linkages to all Central Ministries/Departments and State Governments. Minister of State (Independent Charge) for Skill Development and Entrepreneurship Shri Rajiv Pratap Rudy here today launched the Human Resource and Skill Requirement reports across 24 sectors in India which will serve as the baseline for all skill development initiatives being planned across the country. According to the findings of the reports, the incremental human resource requirement across these 24 sectors is nearly 109.73* million whereby the top 10 sectors account for about 80 percent of requirements. Speaking on the occasion, Shri Rudy said that in line with Prime Minister Shri Narendra Modi's vision of making India the skill capital of the world; this is yet another endeavour from his ministry. He said, as the old adage goes, what cannot be measured, cannot be corrected. The idea behind the Skill Gap Studies is to understand which sectors are likely to face the biggest gaps. He said, it is imperative for us to plan the skilling of future workforce of India on the basis of these reports. Minister of State (Independent Charge) for Skill Development & Entrepreneurship Shri Rajiv Pratap Rudy has said that the National Skill Development Corporation (NSDC) is a public private entity under the Ministry of Skill Development and Entrepreneurship which is working in private space to create training capacities across the country. As on date, it has got 187 training partners with 2930 centres across 474 districts in the country. In a written reply in the Rajya Sabha today Shri Rudy said, the Directorate General of Employment and Training (DGET) under the Ministry of Labour and Employment has a network of 11,972 Industrial Training Institutes (ITIs) (2284 Government ITIs and 9688 Private ITIs) having an annual seat capacity of 16.94 lakh as on 02.01.2015. Further, setting up of new ITIs under DGET or new training centres by training partners of NSDC, is a continuous process guided by demand. The University Grants Commission (UGC) has reported that it has been constantly persuading the universities to introduce academic reforms like introduction of semester system, choice based credit system, grading etc. with a view to bringing about qualitative improvement in higher education in the country. Guidelines, in accordance with the National Skills Qualification Framework (NSQF), were also required for integrating skill and vocational development with mainstream general education in Universities and Colleges. Accordingly, the UGC has issued guidelines for Choice Based Credit System (CBCS) and Credit Framework for Skill Development (CFSD). The CBCS guidelines are available at http://www.ugc.ac.in/pdfnews/9555132_Guidelines.pdf and CFSD at http://www.ugc.ac.in/pdfnews/6925009_SkillNSQF.pdf.